Experts argue over when we start losing collagen; but the general consensus is that from the age of 25, our collagen and elastin levels start to decline at a rate of about 2% per year. Factor this together with our high sunlight exposure here in South Africa as well as various lifestyle factors and you can begin to understand why the ageing process can suddenly seem to escalate. As we age, we lose hyaluronic acid, a naturally hydrating substance, which causes our skin to lose structure and volume, creating unwanted facial wrinkles and folds. Today’s fillers contain this naturally occurring hyaluronic acid to fill in wrinkles and lines and plump up cheeks and even hands, to provide immediate fullness while also helping the skin retain more moisture naturally so that the skin looks firmer and more resilient with a beautiful glow. There are many other reasons too why you might want to explore the option of fillers that are not necessarily age-specific: maybe you want to correct those deep under eye hollows or acne scarring. Maybe you don’t necessarily want to restore what was lost but would like to re-contour and define your features to achieve a more symmetrical, balanced appearance. Whatever your motivation may be, our experienced aesthetic dermatologists will take the time to understand fully the results you are hoping to achieve and design a customised treatment plan to make you look and feel your absolute, confident best. At Atlantic Dermatology and Laser, we have dedicated time to understanding facial anatomy and which filler is best suited for which concern; whether you will benefit best from a thicker filler to contour the cheeks or a smoother filler for the delicate lip area. We believe in subtlety: in using the tiniest of amounts placed strategically to allow for the most natural, refreshed results. There is an incorrect perception about fillers which has developed from the older, less refined way of tackling facial rejuvenation. This is what traditionally has – unfairly – given fillers such a bad name. Take the lines around your mouth, for example. A decade or so ago, filler was often injected into the nasolabial folds, or laugh lines, to literally fill the wrinkles themselves. These days, the goal is to plump and lift in other parts of the face for a more natural-looking result. As you age, your fat pads slide down, which makes the skin sag lower, causing deeper folds at the bottoms of your cheeks. The solution is no longer to “fill in” wrinkles, but to inject filler right near the cheekbone to restore fullness, which lifts the face, reducing the look of the smile lines in the process. 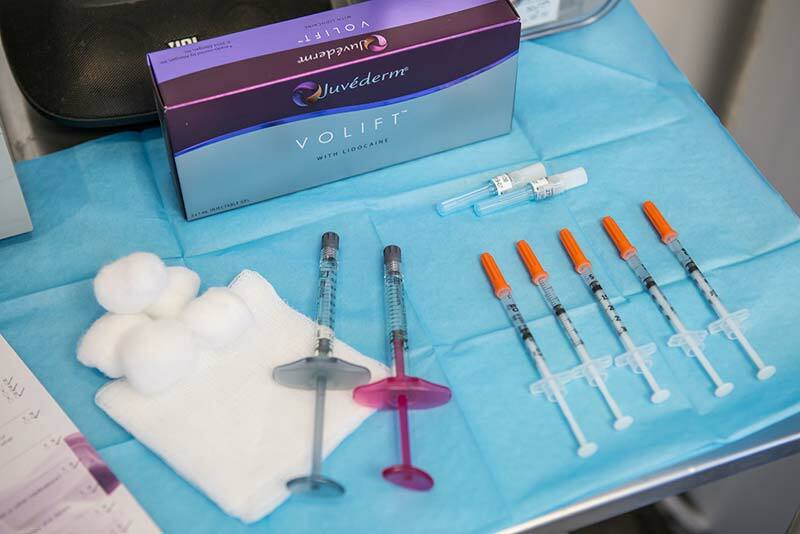 Imperceptibility is the goal and your choice in which “artist” performs your injections is key. In the world of fillers, we are learning how to support muscles, how to layer fillers and how injection technique matters and our team of aestheticians at Atlantic Dermatology and Laser make sure that we are at the forefront of these new approaches. We understand how daunting dipping your toe into the aesthetic world can be, but you can rest assured that with our expertise in the latest techniques, you are in the safest of hands. We will not overwhelm you with options but will clearly analyse where the most volume has been lost and what will give you the best, most natural results in the most cost-effective manner.